By Joel Santana on Apr 17, 2014 - 3 Comments. 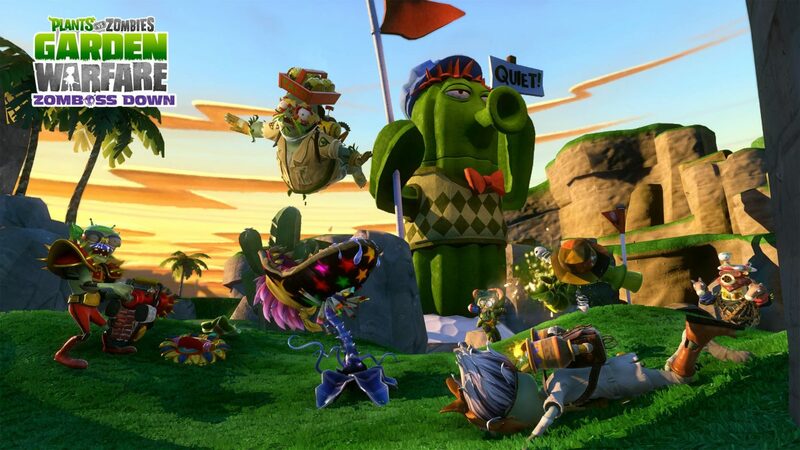 Following up on last month’s impressive DLC offerings, what could PopCap HD do to top their previous work and keep Plants vs. Zombies: Garden Warfare wacky and interesting? Two words: Zomboss Down — a massive Wild Wild West-themed content pack. The free add-on features tons of content ranging from new Western-inspired character variants like the Bandit Cactus and Law Peashooter. It also offers unique weapons for each class, such as the Bandit Cactus’ gatling gun that lets it engage in close-quarter combat, and the Armored Chomper which gives the Chomper the highest amount of health in the whole game. At 225 hit points, it can take much more enemy fire when it’s busy chomping on Zombies. Zomboss Down offers 200 new customization options that let you mix and match items with your favorite class, giving them even sillier new looks. Cactus Canyon is a fantastic addition to Garden Warfare’s map roster. The final objective in Gardens and Graveyards has the Zombies trying to push a giant golf ball into the 18th hole. On paper, it sounds tacky, much like the premises of the rest of the game. But PopCap HD really pulls it off. It’s one of the most creative gameplay moments I’ve experienced yet and is the most fun I’ve had with the game so far. In addition to the new DLC, the latest patch addresses multiple concerns, something that the community will surely enjoy. Primarily, in Gardens And Graveyards, Plants tend to get the short end of the deal in terms of amount of coins earned per game. Thankfully, that is no more, as now Plants earn just as much as Zombies every game. No more need to desperately try to switch over to the Zombies team to snag a larger some sum coins. The update makes the game fun and fair, regardless of what team you are on. Garden Warfare’s Zomboss Down DLC is nothing short of amazing. My only gripe with it is that, aside from some of the new character variants not being much better than the ones found in the game currently, you’ll be spending tons of Zomboss coins trying to unlock everything that this DLC has to offer. At the moment of this writing, I’ve spent close to 1 million Zomboss coins with a good chunk of the new content still left to unlock via sticker packs. I can be a bit of a grind trying to unlock everything. At first glance the feature list for Zomboss Down sounds too be good to be true for a free add-on. It’s no April Fools joke, however. I tried throwing wads of cash at the TV screen, but it just didn’t take my money. Zomboss Down is that good. If Zomboss Down is any indication of what’s in store for Plants vs. Zombies: Garden Warfare, then this game has a very bright future ahead it. PopCap HD has definitely listened to the wants and needs of the community and went out of its way to deliver more than what was expected from a free add-on. 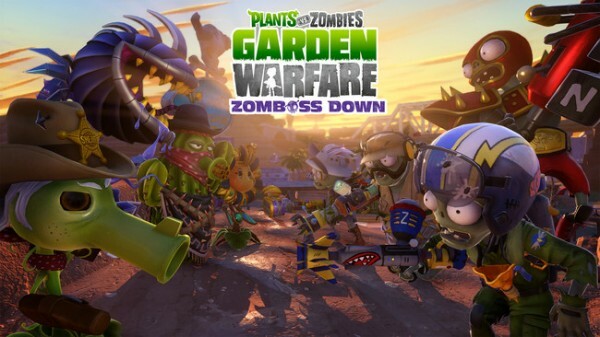 Zomboss Down receives a perfect rating of 5/5 and turns Plants Vs. Zombies: Garden Warfare into a must-buy for those who were on the fence on it. You can catch my Plants vs. Zombies: Garden Warfare review here, as well as my thoughts on Garden Warfare’s previous DLC, Garden Variety, right here.